DianeV Web Design Studio, now in Reno, Nevada, has provided professional website design and other services to large and small local, national and international clients since 1998. Call or go to Pricing & Free Quote for a fast response..
For other inquiries and issues related to our website, please fill out the form below. Items in red are required. 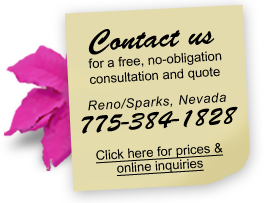 Contact us by email or by telephone in Sparks, Nevada (next to Reno). We'll be happy to discuss your website needs and give you a quote. ©1998- DianeV Web Design Studio™. All Rights Reserved.